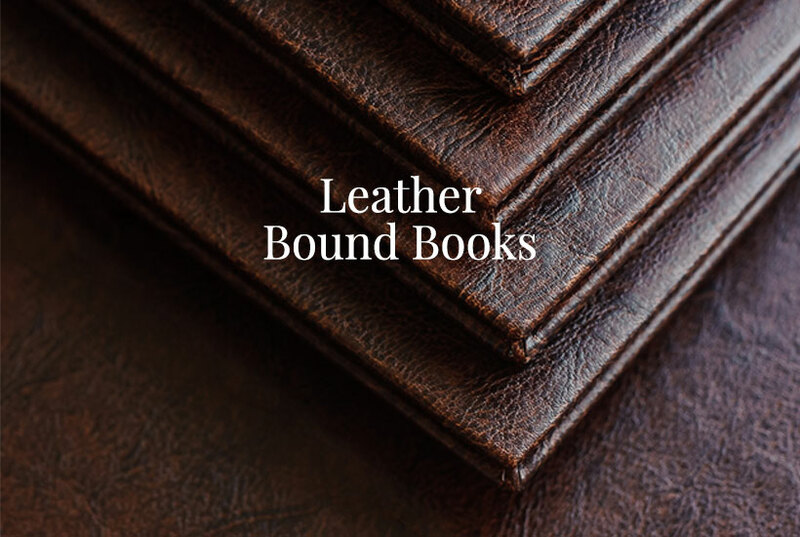 Custom Leather Bound Books are available for Self-Publishers. Do you want Leather Book Covers? Leather bound books are a terrific option for self-publishing authors. Get the luxury of leather book covers. Yeah, we know that you can’t get leather when you do print-on-demand books, but we offer it! Book packagers don’t provide leather or bonded leather book covers as an option. In fact, while they offer cloth, the colors are limited. And forget about getting a different cloth color or leather texture! We know that you can’t get leather when you do print-on-demand books, but we offer it, in addition to imitation leather on embossed paper. Having leather bound books, and in fact, any special covering material, sets an author apart from the crowded field of self-publishers. We print high-quality and reasonably priced books, and the materials are surprisingly affordable. There are two general types of leather. One is bonded leather, and we use this most often. It is real pieces of leather that are pressed into a larger sheet, and stamped and colored with a leather pattern. It is leather and smells like leather. The other option for leather bound books is actual an leather hide. This is thicker and at a higher unit cost. We don’t print-on-demand, so you cannot get one book or 50 in leather. Our minimum print run is 1,000 hardcover or 2,000 soft cover books. That’s because we print high-quality books in signatures, and on a real printing press. Everything is top quality. Did I mention affordability? Yes, that too. The printed cover is the least costly. Cloth is the next level up from printed paper which is the default covering material for hardcover books. There is so much we can do with the design of a cloth covered book. For instance, we have textures and pattern options, in addition to color options that you won’t find anywhere else. Pick black, or brown, or charcoal colors. How about red, off white, or tan? You can even choose a cloth or foil paper that has a leather-like texture imprint. What do you think of lime green? We have many options and choices. Add a blind stamp or a foil stamp. Yes, gold and silver are available, but what about bronze, or black, or red? We have other colors too. What about a gloss foil look, or do you prefer a matte finish? Add a tip-on image to leather book covers. A cloth or leather bound book with a foil or blind stamp, plus a tip-on image, can stand alone without the need for a dust jacket. As with any book, you will need book layout and design. If you are going it alone, InDesign is the first choice of professional book designers. Microsoft Word is often used by self-publishers for black and white novels, but not coffee table books. What are you waiting for? At least get a quote to see what it costs to print high-quality leather bound books. Give us a call to discuss your leather book covers! Nancy Starkman is a book self-publishing expert as well as a book printing broker and book designer. She co-founded Star Print Brokers in 1999. SPB works with self-publishers in the USA and other countries to print and ship books worldwide. Self-publishers get the highest quality books at a low unit cost, keeping 100 percent profit and all rights. Yes! We print hardcover books in a variety of cover wraps including cloth and leather. We also work with authors in Canada and all over the world. I’ve passed your contact information on, and someone will contact you to get more information about your book, so that we can provide a quote. Nancy Ostling Starkman, co-founder of Star Print Brokers, Inc., book printing expert, book designer, and blog author.